Heat oven to 375°F. Line large cookie sheets with foil; spray with Crisco® Original No-Stick Cooking Spray. Microwave frozen potatoes as directed on package. Meanwhile, in 12-inch skillet, heat olive oil and butter over medium heat. Add leeks; cook 2 minutes, stirring occasionally. Add potatoes and thyme; cook 1 to 2 minutes, coarsely mashing potatoes with fork. Remove from heat; cool mixture slightly. Separate both cans of dough into 20 biscuits. Press each biscuit into 3 1/2-inch round. Spoon about 1 heaping tablespoon potato filling in center of each round. Fold dough over filling; press edges to seal. Place cheese in shallow dish. Press biscuits into cheese to generously coat all sides. Place 2 inches apart on cookie sheets. Bake 11 to 15 minutes or until golden brown. Cool 2 minutes on cookie sheets. Serve warm. Piroshki are small Russian turnovers. 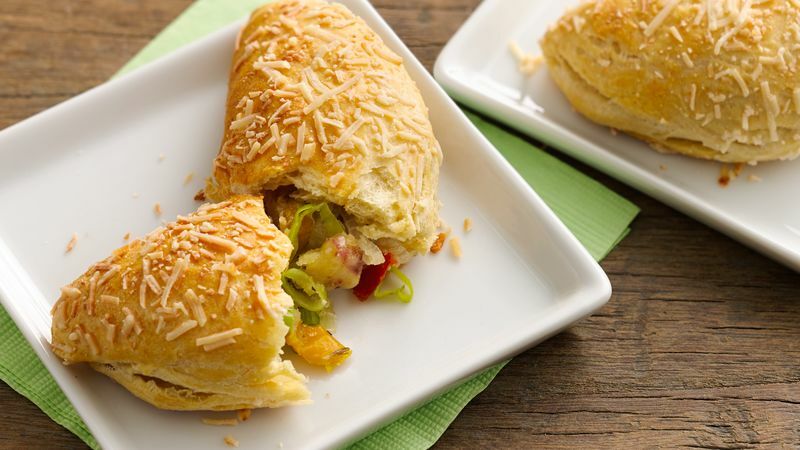 They are served as appetizers and can be filled with savory or sweet fillings.